DeSean Jackson has played his last game with the Eagles. PHILADELPHIA — Unable to find a taker on the trade market, the Philadelphia Eagles Friday released dynamic wide receiver DeSean Jackson. Jackson was coming off a career-best season in Philadelphia, leading the team with 82 catches for 1,332 yards and nine touchdowns. He had a $10.25 million contract for the 2014 season and was signed through 2016. 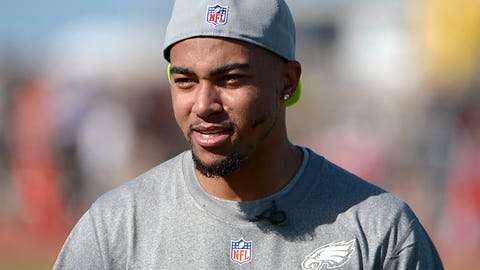 "After careful consideration over this offseason, the Philadelphia Eagles have decided to part ways with DeSean Jackson," the Eagles said in a statement. Jackson thanked the Eagles organization and fans in his own statement Friday, and also denied "unfounded reports" that he was released for off-field issues. "I would like to make it very clear that I am not and never have been part of any gang," Jackson said in a statement. " I am not a gang member and to speculate and assume that I am involved in such activity off the field is reckless and irresponsible. I work very hard on and off the field and I am a good person with good values. "I am proud of the accomplishments that I have made both on and off the field. I have worked tirelessly to give back to my community and have a positive impact on those in need. It is unfortunate that I now have to defend myself and my intentions. These reports are irresponsible and just not true." Jackson has 356 career receptions for 6,117 yards and 32 touchdowns. He’s a dangerous returner who went to the Pro Bowl in 2009 after taking two punts the distance. Jackson has four career scores on punt returns, including the memorable 65-yard game-ending return to cap a comeback win over the New York Giants in 2010. The 27-year-old receiver is entering his seventh NFL season. The Eagles had been put out feelers that Jackson was available. Coach Chip Kelly refused to commit on Jackson’s return at this week’s NFL owner’s meetings. Speaking at the NFL meetings, Jets owner Woody Johnson expressed interest in Jackson, saying: "We’re looking at a number of players, including DeSean." Jackson upset the Eagles when he lobbied for a new contact shortly after they were eliminated in the playoffs. His departure leaves the Eagles with Riley Cooper and Jeremy Maclin as the starting wide receivers. "We just made an extremely unpopular decision, but I couldn’t be more excited and happy with where this organization is going!! (hash)FlyEaglesFly," offensive lineman Jason Kelce tweeted.